A plot is basically the skeleton of a story; it is the foundation that births the characters and the scenarios they find themselves in. Plot is absolutely essential to any work of fiction: if you plan on writing a story without a plot, don’t even expect your mother to read it, yet alone the rest of the world. Most works of fiction follow a plot, sometimes it’s a very linear plot, sometimes it’s a head numbingly complex plot, but in both cases the plot can either be amazing, awful, or anything in between. I am going to outline for you a bulletproof formula to plan and establish a solid plot for your story. This system was developed by James Scott Bell, author of the book Plot and Structure and is very easy to remember – it’s called the LOCK system. Before I deliver the goods, let’s all sit in a small circle while I tell tall tales of the history of plot! In 350BC the philosopher Aristotle decided that plot was the most important element in drama, even more important than characters, and he insisted that all plots should have a beginning, middle and an end. Aristotle developed what he called ‘The Unified Plot’, which was a pyramid outlining his richly complex understanding of plot. The triangle shape, which he no doubt drew in the sand to others amazement, had the words ‘Beginning’, ‘Middle’ and ‘End’ written on the triangle’s three points. Pure Genius right? Exposition – this is the beginning of the novel, and it is where the writer introduces all of, or most of, the main characters that will appear throughout the story. It also introduces the protagonist, and describes what sort of character he or she is. This part of the novel is also used to describe the setting, which is especially important in Science Fiction and Fantasy novels, where the reader needs to be able to visualise where the story is actually taking place. This is a critical part of the novel, as it needs to ‘hook’ the reader in and make them want to keep reading, you don’t need to really flesh your characters out just yet, but it is crucial to make a good first impression for the reader here. Once the exposition is over, the next part of the plot begins, or thickens – the introduction of conflict. Rising Action – This is where the novel starts to build its tension, which increases gradually until the novel’s climax, where the tension snaps like a guitar string that has been strung too tightly. The reader should be kept on the edge of their seat, as a writer you should aim to keep reader’s up at night reading or thinking about what will happen next. The tension doesn’t have to be physical – it can be psychological, it can be subtle or it can be blatantly obvious – but it needs to have some sort of rising action. Generally this phase of the novel involves the protagonist (and the reader) understanding his/her mission, and the starting steps towards realising it. Problems need to arise at this stage of the novel; therefore any obstacle to get in the way of the lead character is essential, even the protagonist can be an obstacle to him/herself. You can’t have a novel where nothing happens, well you can, but no one will read it, loved ones will pretend to have read it at best. At the completion of this phase, the protagonist can finally see his goal in sight and can go towards it without obstruction. Climax – This is when all that tension you’ve built up starts to unravel, much to the reader’s excitement. At this stage of the novel, the protagonist’s qualities really have to shine through, the reader must see the lead character in a tense situation and see how they deal with it. This is where the fate of the story and its characters starts to reveal itself. The climax is a point of no turning back, for the characters or the reader, unless it’s a ‘choose your own ending’ type story (please make sure it isn’t) then the reader is forced to read on and accept whatever decisions you as a writer make for your characters. The ending you write is the ending your readers have to read, so don’t disappoint! Generally, a final confrontation of some sort should take place now. 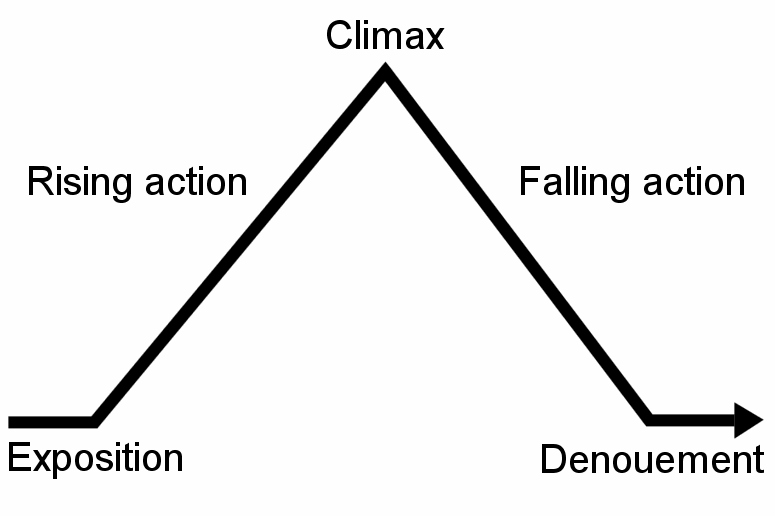 Falling Action – This is where all the pieces are collected and the loose ends are tied, the reader is being parachuted down from above and needs to be given some time to absorb everything that has happened in your climax. It is up to you how often you do this, you can if you like, have a succession of mini climaxes followed by ‘rest’ periods of shorter and shorter duration and then end it on a big climax. I’m not going to tell you how to write your story, but that is something you can consider. Readers will be aware that they are reaching the end of the novel when they hit this stage, so naturally this part of the plot can often be the most tense and exciting. It is a good idea at this time to reveal details about characters and situations that were unknown before now. This phase ends, cools off, and starts off again as the end of the story – the resolution of the hero’s adventure. Now on to the LOCK system. This is probably the simplest and most important formula for structuring your novel, and if you like it, you should definitely check out the book where I learnt this from: Plot and Structure – Note I am condensing and paraphrasing parts of the description of the LOCK system from this book. A strong plot starts with an interesting lead character – someone the reader won’t mind following for the whole novel. Make the character human, draw from your own self for inspiration; reader’s have to be able to relate to the character on some level. Objective is the driving force of fiction; it generates forward motion and keeps the lead from just sitting around. An objective can take 2 forms. To get away from something. Opposition from characters and outside forces brings your story fully to life. Readers want to worry about the lead, keeping an intense emotional involvement all the way through the novel. Just like how we watch boxing for the knockout at the end, we also read novels to be led to an ending with knockout power. ‘Woah, I didn’t see that coming, you hit me good!’ is what you want your readers to say after the knockout. Even better, you don’t want them to say anything; you want them to cry from pain. We want to feel the ending weeks, even years after the final punch. A great ending can leave the reader satisfied, even if the rest of the book is somewhat weak (your mum will get a nice big surprise at this point, because any other reader would have put it in the trash if the build up to the end stank). But a weak ending will leave the reader with a feeling of disappointment, even if the book up to that point is strong. And there you have it, the LOCK system: a lead with an intense objective, thrust into confrontation, runs through the story until it ends. The objectives can be external or internal, the confrontations can be physical or psychological, but either way the LOCK system works in all cases. You’ll no doubt have noticed already while reading this, how the system applies to a lot of books you might have read. And there you have it: be sure to check out the original post, which contains some writing exercises to help you on your way to crafting the ultimate plot!